Peirce College is extremely excited and honored to announce the Second Annual Peirce Voice Winner: Nathaniel James Griffin III. This inspirational student is a former U. S Army Sergeant and served as a Combat Medic from 1986 to 2013. He is an ordained minister, a father of four children, a singer and songwriter, an inspirational speaker, and the founder and owner of The Sgt. Nate Fitness Studios in Center City Philadelphia. Oh, and he is about to be a Peirce College Graduate (for the second time) earning his Bachelor of Science in Organizational Leadership this June! Nathaniel’s journey with Peirce College was not the traditional route. He enrolled at Peirce College in 1998 but left after his first year to start his own business. After realizing the need for a degree and further knowledge on opening and operating a business, he re-enrolled in 2012 and went on to receive his Associate in Science in General Studies in 2015. After discovering his desire to learn, explore and share knowledge, he stayed on board at Peirce College and enrolled in the bachelor’s degree program for Integrated Leadership (now Organizational Leadership). During this season of study, he was able to immediately apply what he was learning directly to his business. “It was a challenge juggling my academic studies, running a business and maintaining what was left of a social life. 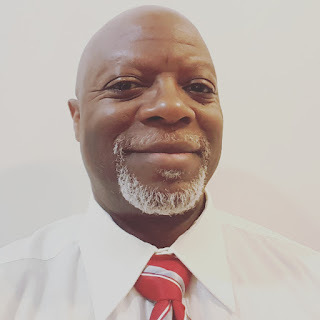 However, with the help of my academic advisor, the Walker Center’s amazing tutors and support from friends and clients, this former sergeant soldiered on,” explained Nathaniel. Nathaniel is now considering going on to get his master’s degree this fall, which will serve him well as he continues to grow his business and train new leaders for the future. As the Second Annual Peirce Voice Winner, Nathaniel will be the National Anthem singer at the 153rd Commencement Ceremony on June 11, 2018. When Nathaniel takes the stage to sing, it will not be his first appearance. Nathaniel performed the National Anthem at The Philadelphia Phillies game on July 4, 2001. He also performed on the steps of the Art Museum during the passing of the Olympic torch in 2000 and at The Sons of Liberty Ceremony in 2000 and 2001. Peirce College is thrilled to have such a passionate and driven student (and soon to be alumnus) sing at this year’s commencement ceremony. Congratulations to Nathaniel! 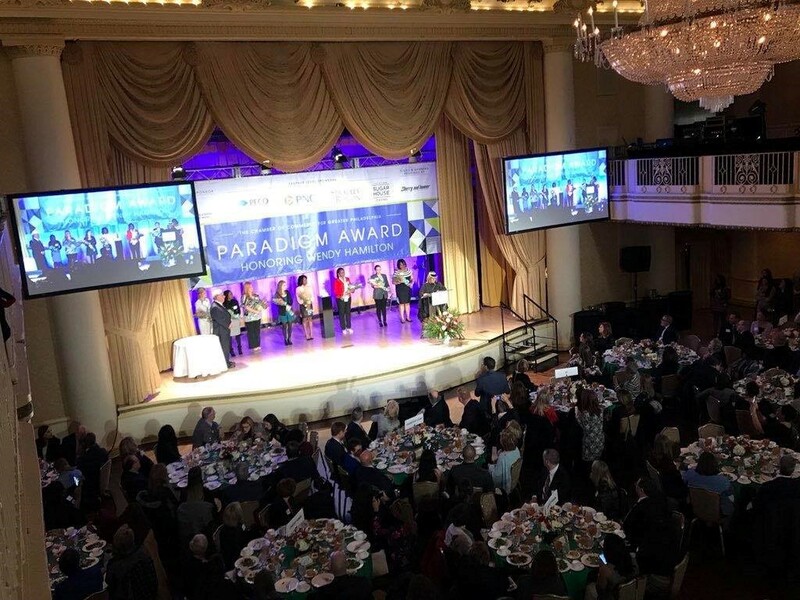 Gabriel Grove, a 2015 Peirce alumna, has tackled some of life’s toughest challenges, but with a resilient and driven spirit, she has achieved more than she ever imagined. In 2006, Gabriel was living in a homeless shelter with her children when she took a look around. In the midst of dealing with her own challenges, she could not help but notice how much larger the issue now affecting her family really was. Even while she was busy caring for herself and her family as a resident of one of Philadelphia’s local shelters, Gabriel still found time to make a plan to help those around her. After taking classes at a variety of colleges and universities, Gabriel finally enrolled at Peirce in 2014 after hearing about the flexibility Peirce offered and the 25% tuition discount she received thanks to Peirce’s corporate partnership with Independence Blue Cross, her employer at the time. 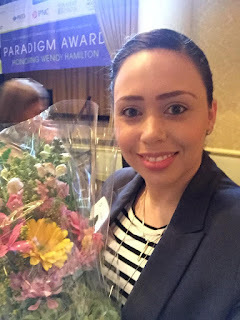 In 2015, Gabriel accomplished her goal and graduated with a Bachelor of Science in Integrated Leadership (now called: Organizational Leadership). Following this accomplishment, Gabriel set out on her next mission: changing the world. In July 2017, Gabriel was finally able to set her dreams into action. She opened her very own non-profit, For Her Sake Foundation, Inc., where she collects essential toiletries—from toothpaste to soap—and donates them to local women’s shelters. A believer in investing in her own cause, Gabriel often self-funds those supplies to ensure she can increase the number of people she serves. In less than a year since starting her organization, Gabriel has already been able to donate to nine shelters in the Philadelphia area, assisting women who don’t have access to these items. In addition to this work, Gabriel has also found a way to be sure she is giving back at the college that helped her earn the degree she always wanted. Gabriel recently partnered with Peirce to launch The Gabriel Grove Scholarships. The first book scholarship will be awarded to a woman in the Information Technology field, as Gabriel would like to encourage more gender diversity in the industry. The second book scholarship will be awarded to a woman looking to earn her master’s degree in Healthcare Administration at Peirce. Gabriel is also earning her master’s and wants to ensure other women are not constrained by financial barriers as they pursue their goals. Peirce College is grateful for Gabriel’s generosity and encouragement. While she continues to chip away at making the world a better place, we are proud to see that she is #PoweredbyPeirce and is ensuring other students can do the same. The conversation at the event was led by these unique experts who opened up about their educational, personal and professional backgrounds with the audience. They also led a discussion on requirements for entering the field and best practices for the application and interview process. They allowed for the community to hear their stories and learn from their own experiences. Additionally, they opened the floor for questions where the audience could get involved and ask the hard-hitting questions everyone was thinking. 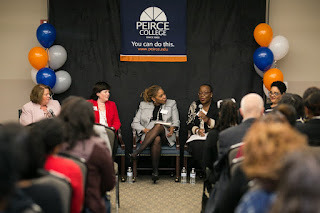 This event ties directly into the goals of the Peirce College Criminal Justice Program, which includes the opportunity to best prepare our students with workforce-relevant skills for those aspiring to enter the criminal justice field or to advance in their current criminal justice position. This event ties the knot between real-world and classroom experience, which is vital for our students’ success following graduation. Peirce's Criminal Justice Program provides a solid foundation for progression in many different criminal justice fields of study including law enforcement, correctional system, criminal investigation and more! This foundation is made possible with the help of courses such as, Introduction to Criminal Justice, Criminology, Juvenile Court Systems, Criminal Law, and Criminal Investigation, just to name a few. Our faculty is made up of experienced criminal justice professionals from a variety of backgrounds including police officers, district attorneys, and seasoned investigators. Students who join the Criminal Justice Program have the opportunity to receive their associates and/or bachelor’s degree. 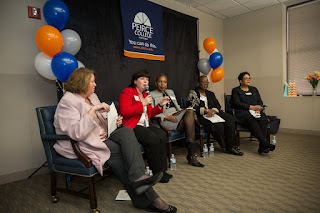 Peirce is humbled to have been able to welcome such an elite panel of professionals in order to offer an event like the Criminal Justice Panel and Networking Event for our students, so they can expand their knowledge beyond the classroom walls and best prepare for their dream careers. To get started or to learn more about our Criminal Justice program, please contact us at 215.670.9000 or info@peirce.edu. Check back in next month to see what program feature will be up next! Vanarath Chan, or Lily, as she likes to be called, is similar to many Peirce College students in that she has a very unique background. But, unlike many Peirce College students, Lily is originally from Cambodia and speaks several different languages. When Lily moved to the United States just four short years ago, she did not sit back and slowly transition into her new surroundings. 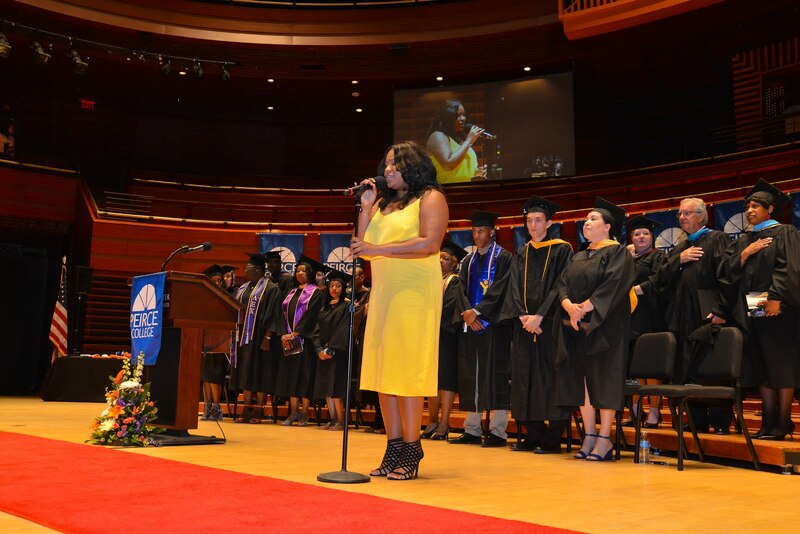 Instead, she jumped right in and enrolled at The Community College of Philadelphia (CCP) eager to further her education. Lily originally thought she’d like to become a veterinarian due to her love of animals, but when she started classes at CCP, her path started to change. Lily began to recall memories of how much she had enjoyed helping her uncle in his law office in Cambodia where she assisted him in translating patient files into English. She took those memories and decided to find a career, which would allow for her to continue doing what she loved. That’s when Lily found the Paralegal program. As Lily describes, her two years at CCP flew by and she commends CCP for providing her with a wonderful foundation in legal studies. The more Lily learned about the field, the more that immigration law interested her, and Lily now says that she hopes she can someday work as an immigration lawyer helping people go through the same process she once experienced. “Many Cambodians and other Asians need facts about immigration and help in getting their families over to the United States, and I would love to turn that into a career,” Lily says. When discussing her transition to Peirce College, Lily said it seemed like the perfect fit for her. The Dual Admissions program was a huge selling point in addition to the close proximity to CCP. Once she came in for a visit and met with Peirce College’s International Student Enrollment Specialist, Kieu Tran, she found out that Peirce’s Paralegal Studies program was also American Bar Association approved, and her mind was made. 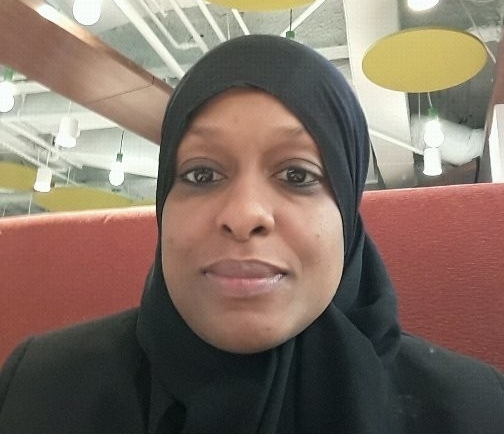 The only real challenge she had to overcome when she started classes at Peirce College was adjusting to evening classes instead of the day classes she typically took at CCP. “I just had to get used to doing all of my school work during the day and then attending class at night, which was the opposite of what I was doing at CCP. Once I got the hang of it, I was fine,” explained Lily. 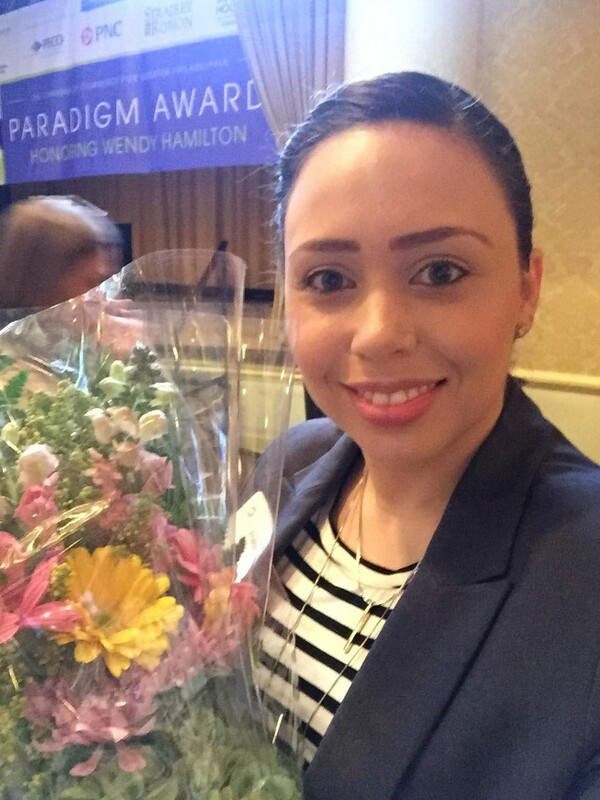 When she’s not attending classes at Peirce College or preparing for a career in Immigration Law, Lily’s favorite hobbies are working with animals and traveling. She’s been all over Asia and recently visited Australia, and looks forward to taking more international trips in the future. We wish Lily luck in all over her educational and professional endeavors! Chances are that you have been to a job fair before. You could have wasted away 2 or 3 hours of your life getting jostled around by hundreds of other job seekers, only to leave with a stack of business cards for people you don’t remember and sore feet that you can’t seem to forget. That’s because if you don’t strategize, job fairs can be a waste of time! If you show up without an updated resume, a memorable introduction, or even a big smile, you may have taken a step backward. Before arriving, research the companies who will be there, ask a friend to help you practice your professional introduction and have a list of “warm up” tables you’ll visit before introducing yourself to your dream company. Additionally, be sure to dress to impress! Get your suit dry-cleaned (or get a new interviewing outfit through Career Wardrobe – contact CDS for a referral). You wandered around from table to table, collecting promotional pens and waiting for someone to recognize your brilliance, like a diamond in the rough. It never happens. Here’s the thing: most employers don’t do on-the-spot interviews or hiring. They’re not Oprah with a bag full of jobs to sprinkle on their adoring audience: they are there to generate interest in their positions so they can then select the best candidates (usually after a series of interviews). 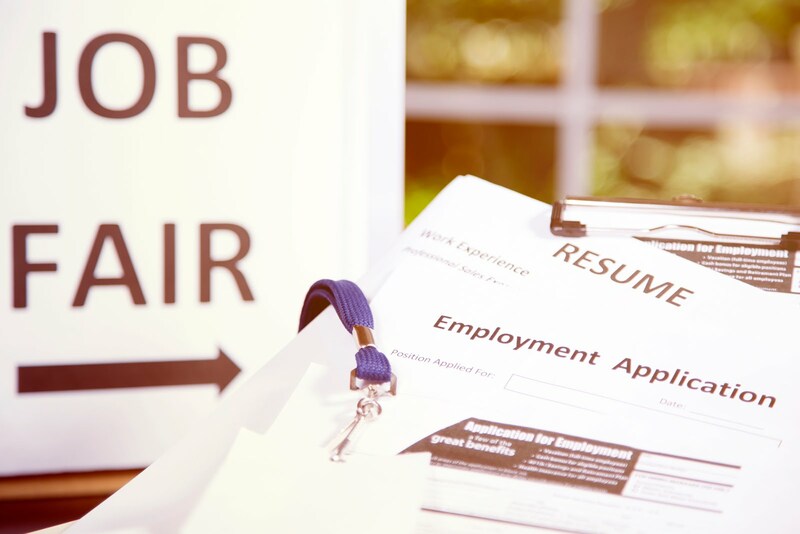 Job Fairs are hectic for both job seekers and recruiters, so they will want to schedule some one-on-one time after the job fair to properly vet these candidates. Keep in mind that you are attending this job fair to make connections with people. If you wait until someone spots you, you will be waiting forever. So go introduce yourself, ask some questions, and find out about the next step in their hiring process. Ideally, you will be able to follow up directly with the person you met, so remember to ask for contact information (and take a moment before you move along to make notes about your interaction). The next day when you reach out through email or LinkedIn, don’t hesitate to mention the memorable aspects of your discussion. Did you find out that you are both originally from North Carolina? Did she remark on the subtle polka dots in your tie? Remind the recruiters of those interactions to help personalize and humanize your job search strategies. After visiting each and every table at the job fair, you realize that no one is looking to fill the job you want. Therefore, nothing will ever come of this, right? Wrong -- perhaps you are in a very niche field or seeking a specific position that does not have many openings. However, your objective at this job fair is to make connections with the recruiters and let them know how you fit in with their organization’s culture and core values. They might be there looking to fill positions for 20 front-line workers, but those front-line workers will need a manager. Tell them about your management qualifications and keep in touch so that when they do have that a managerial opening, they remember you! Think outside the box! A law enforcement agency might have IT openings, a social services organization might be looking for managers, and a hospital might be recruiting for their human resources and accounting departments. If you are creative in your job searching pursuits, you will open yourself up to a world of opportunities. Ultimately, job fairs can be a waste of time. Peirce’s unique job fair strategy ensures that you will not spend time meeting recruiters who aren’t seriously recruiting. Each one of our employers is vetted to ensure they are recruiting for actual open positions. No services or sales pitches here! Our employers know about the majors offered here at Peirce and are specifically looking to recruit candidates to fill positions in the legal, healthcare administration, IT, or management fields. Prepare a quick introduction and a few questions you can ask recruiters. Refocus your job fair goals to make connections that will pay off in the future. Dress for success. Demonstrate your ability to exceed expectations by wearing a business-appropriate outfit or suit. Contact Career Development Services now for a referral to get a free interview suit! 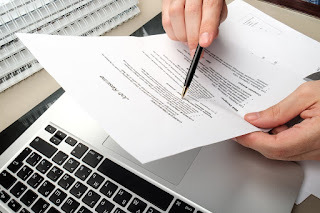 Yes, bring several copies of your resume, but don’t be surprised if you are redirected to the company website (sometimes it’s just company protocol!). A folder or portfolio: bring a place to stow marketing material and business cards (a folder with pockets works great). A way to take notes to remember specifics on who you talked to so you can write a memorable follow-up email or LinkedIn request. A notepad works, and so does the memo app on your phone. Keep a positive attitude throughout, even when you are in the hallway, elevator, or restroom. You never know who is listening in! Follow up immediately to solidify these connections and stand out from the competition. For assistance with job searching, contact Career Development Services at 215.670.9202, cds@peirce.edu, or visit the office in Suite 67, College Hall.